1. Explain, with the aid of diagrams, the following in relation to the construction of power transformers. Include the advantages and disadvantages in your description. 4. Describe three different industrial tariff structures; include details of the type of business that would suit each tariff structure. a) Three commercial tariffs from an energy supplier are shown below. Using these (or other commercially available tariffs), determine the most suitable tariff for the factory detailed. Your answer must be supported by mathematical analysis. b) Suggest changes to the working practices of the factory detailed in order to reduce the energy consumption and the cost of the energy bill. The factory is fed and metered at 400/230V three-phase and neutral. It consists of a main factory area, a storage warehouse for incoming raw materials and final products awaiting delivery and a small office block.The main intake position is situated at one end of the factory and sub-main feeds are taken to the warehouse and office block. The factory is on one level with large open doors at one end where goods and materials are moved to and from the warehouse. It is constructed of brick walls with a high single pitched roof and few windows. The warehouse is a tall building of similar construction to the factory with two roller shutter doors, one for deliveries of raw materials and one for distribution of the finished product. The office block is a brick building with a flat timber and felt roof. It has recently been refurbished. New double glazed windows were fitted and the electrical supplies and the lighting scheme were brought up to modern standards. The three graphs shown indicate the load pattern for the whole factory complex. 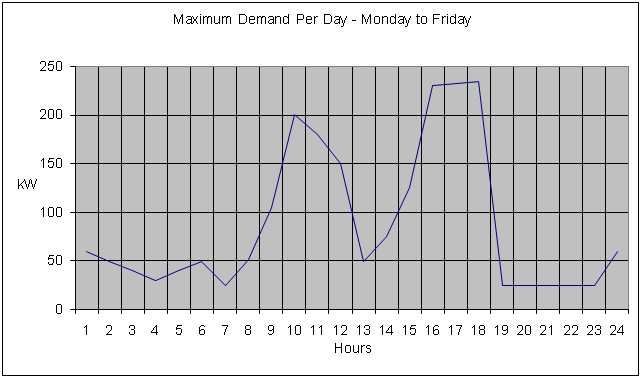 The load profile for Monday to Friday and Saturday and Sunday can be assumed to be reasonably constant throughout the year. 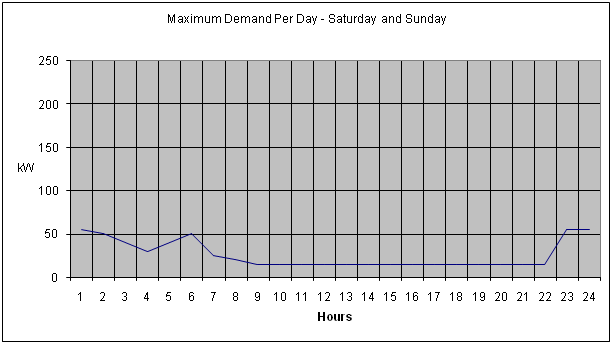 Seasonal changes can be identified using the third graph as this shows the loading based on a weekly maximum demand. It can be taken that the initial cost of static, loss-free capacitors, including that of the necessary control gear is £65.00 per kVAr. The annual interest and depreciation charges total 12% per annum. The total number of units consumed during the 12 month period 2011 was 384,125. A 2800-V, 2-A, dc power supply is to be designed with a ripple voltage ≤ 0.5 percent. Assume that a half-wave rectifier circuit (60 Hz) with a capacitor filter is used.